What is a traditional handfasting ceremony? As far back as ancient times, handfasting existed as an elegant marriage ritual. No diamonds, no jewellery, only two people who loved each other and wanted to spend their lives together! The ceremony involved binding together the hands of couples with rope, ribbon, a sash or cord. As knots were tied and couples showed their commitment to each other, so too were their lives bound together. Handfasting was and still is one of the most beautiful and unique ways to represent couples’ union and is the basis of the phrase, "tying the knot"! 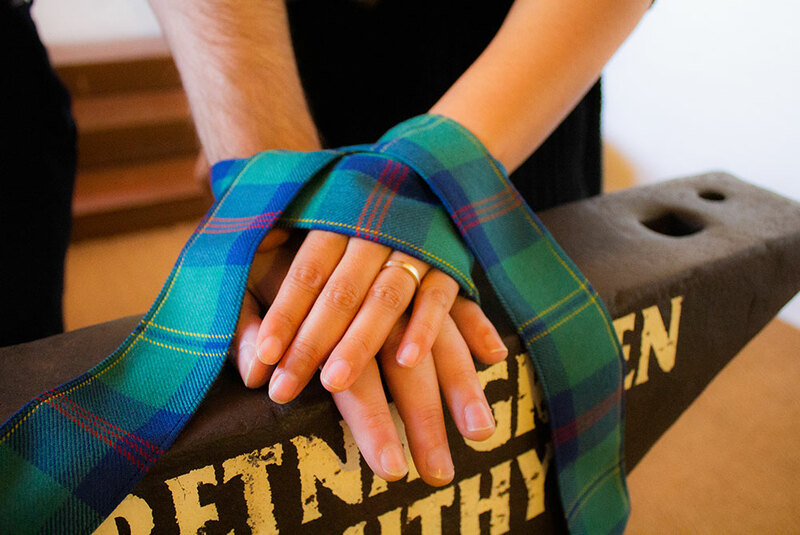 What does handfasting mean to Gretna Green and you? Here at Gretna Green, we provide romantic and intimate handfasting ceremonies for all types of occasions such as renewing your wedding vows, celebrating your engagement or an important anniversary, or even just confirming your love to each other. The service isn't religious or legally binding, but you can tailor your ceremony and make it extra special by incorporating your vows, promises or special words with our traditional anvil blessing. Just like an anvil wedding, Let the sound of steel on steel seal your love! Handfastings aren't solely for lovers. Families and friends also can share this experience and design a bespoke ceremony to enjoy cherished moments with each other. Handfasting at Gretna Green is one of the best unique and personal gifts available. Both our traditional handfasting ceremonies and our new handfasting experience package can be purchased as a gift. Click here to find out more.